Severe intellectual disability (ID) occurs in 0.5% of newborns and is thought to be largely genetic in origin1, 2. The extensive genetic heterogeneity of this disorder requires a genome-wide detection of all types of genetic variation. Microarray studies and, more recently, exome sequencing have demonstrated the importance of de novo copy number variations (CNVs) and single-nucleotide variations (SNVs) in ID, but the majority of cases remain undiagnosed3, 4, 5, 6. Here we applied whole-genome sequencing to 50 patients with severe ID and their unaffected parents. All patients included had not received a molecular diagnosis after extensive genetic prescreening, including microarray-based CNV studies and exome sequencing. Notwithstanding this prescreening, 84 de novo SNVs affecting the coding region were identified, which showed a statistically significant enrichment of loss-of-function mutations as well as an enrichment for genes previously implicated in ID-related disorders. In addition, we identified eight de novo CNVs, including single-exon and intra-exonic deletions, as well as interchromosomal duplications. These CNVs affected known ID genes more frequently than expected. On the basis of diagnostic interpretation of all de novo variants, a conclusive genetic diagnosis was reached in 20 patients. 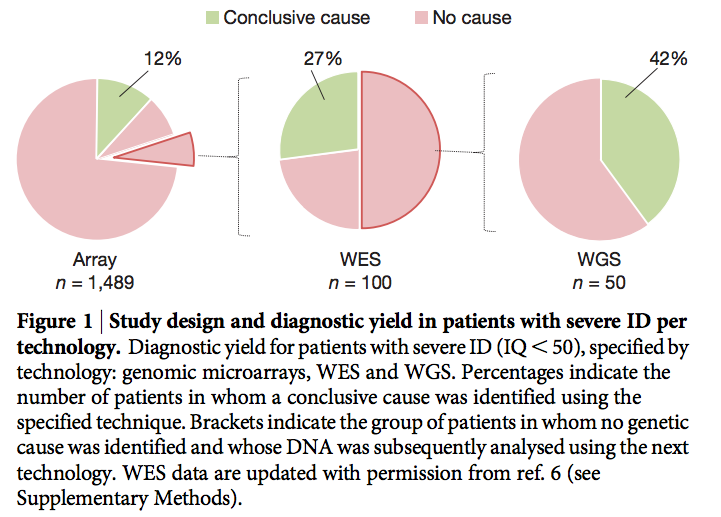 Together with one compound heterozygous CNV causing disease in a recessive mode, this results in a diagnostic yield of 42% in this extensively studied cohort, and 62% as a cumulative estimate in an unselected cohort. These results suggest that de novo SNVs and CNVs affecting the coding region are a major cause of severe ID. Genome sequencing can be applied as a single genetic test to reliably identify and characterize the comprehensive spectrum of genetic variation, providing a genetic diagnosis in the majority of patients with severe ID. The problem with studying people with IQ's below 50 is that their disabilities are likely to be organic rather than familial and thus not part of the biologically normal variation in IQ. It is for this reason that there are more people with IQ's below 50 than the normal curve predicts; the normal curve is includes only the biologically normal population since the standardization samples of the Wechsler exclude anyone with mental disorders. In the normal population, lower IQ people have lower rates of myopia, but in the Downs Syndrome population, myopia rates are undiminished. This is because, according to Jensen, the chromosomal abnormality overrides the usual source of polygenetic IQ variation. An IQ 150 parent is just as likely to have a Downs Syndromr children as an IQ 85 parent, however the latter is far more likely to have a child with non-organic low IQ. But here's the question: Do the Down's Syndrome children of genius parents average higher IQ's than other Down's Syndrome kids, or does the parents' IQ lose it's genetic influence when the child have Down's? Mutations of large effect may yield clues about impairment of cognition (i.e., molecular mechanisms). That may help to identify variants of smaller negative effect ("nicks") in the future. It may yield clues as you say, but it may also cause wild goose chases. I defenitely agree that looking at cognitive outliers (high or low) is an excellent way to find IQ genes, but in my humble speculative opinion, a more efficient approach might be to look only at familial outliers and not at organic outliers. The reason is people with a familial IQ below 50 are outliers only with respect to IQ and largely normal on many other traits which might make it much easier to isolate genetic effects on IQ. They are biologically normal, they're just at the far extreme end of normal variation. By contrast, the majority of people with IQ below 50, are organic, and these people are outliers in a wide variety of traits, not IQ only. They are qualitatively, rather than just quantitatively different. You had stated that these low abillity individuals account for 0.5% of new borns. Could this mean that the are the 1 in 200 embryos whom experienced really unfair genetic crossover during meiosis(in regards to cognition). If embryos can exibit a normal distribution(of course) then doesn't it mean that 1 in 200 embros are also at iq 150? If so then could embryo selection gains be comulative or just diminishing? Seems we can learn from the special cause variation on either tail. It is just as well to look for the anchors that hold us back as to look for the rockets that shoot us up. The goal is to learn from those so we can shift the mean up for the common cause variation.